Okay, that was maybe a cheesy title, but I just wanted to share with you my excitement about the coat that arrived over the weekend. This is the coat I designed and submitted to Garmz.com, back in October. They sewed a prototype, then made a production run, and here it is! I'm so thrilled with this! I love this jacket because it can be worn so many different ways. It looks goo with the cuffs, without, with the collar, without, with no fur at all, or just the collar and no cuffs (my preferred). It's very good quality tweed, nice and snuggly warm, and the fit is quite precise. 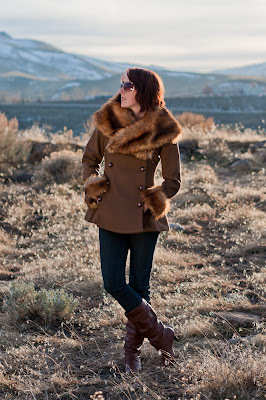 I've always had trouble fitting winter coats, to be honest, but this one curves in and out in all the right places. If you like the coat, and want to support Garmz.com and myself (ever so slightly), then you can buy it on the Garmz website - Click Here. Special thanks to everyone who voted for the design back in October and November, and I hope you like the final outcome as much as I do! The link to the Garmz website sends us to Chris Stowell's site. Love the coat though - breathtaking! ooo, copy-paste fail on my part! Links all fixed now! Thank you for giving me the heads up! I bought a coat and just got it the other day. It's really beautiful, and I love the design. I do wish the garments came in larger sizes though. I ordered the 16, and it fit in the shoulders and back, but there was no way to get the front to button across. I'm not thin, but I don't wear plus sizes either, so it's kind of a bummer about the sizing. However, I think I came up with a solution - the coat does close, and I think it would fit perfectly if I moved the buttons to a single row down the front. And an easy fix that won't look strange, the way the button holes and panels are placed. I know it's not your original design (which I do love), but it's too pretty a coat to send back, especially because it fits fine otherwise. 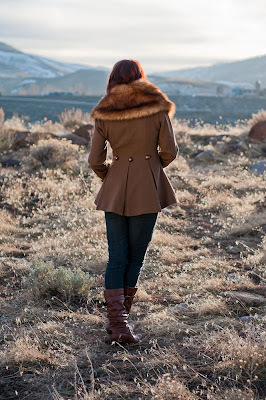 The quality of the coat seems very nice, and I love that the collar and cuffs are removable. The way the collar attaches is quite nice (and I think will work with both ends attaching to a single button. And the beauty is, I can always move the buttons back to the original placement. First off, thank you SO much for buying one of my coats! I get a little commission each time it sells, so you have helped me out directly! Yes, I agree, the fit is tight across the bust. Mine is too and I don't have that large a chest. I have specified on all my other designs, should one ever be chosen for future production, to please have larger sizes! Thanks again! I'd love to see a photo of you wearing it! Lovely! 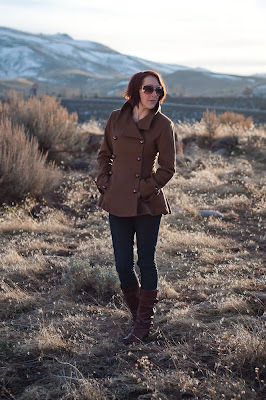 I wish I didn't already have 9 winter coats in my closet - and that I could wear brown. Hopefully the next garment will work for me! is this coat sold out now?